This week our nation has endured great tragedy. On Monday two soldiers were run down with a car, and one of the them, Patrice Vincent died of his injuries. And then on Wednesday we all heard the news come over the radio, tv or internet. There had been a shooting on Parliament hill, a solider had been killed at the National War Memorial, and then there were shots fired inside Parliament. Security officials and police locked down Ottawa for hours as the rest of us waited to hear if there was going to be more… more gunmen, more bullets, more violence, more chaos. In the days following, we learned just how dangerous this situation was. We learned that shots were fired just outside of the rooms where many of the members of our federal government were meeting. We learned that the gunman had passed by dozens of bystanders and had easily gained access to heart of Canadian democracy and government. And since then, all Canadians have been shaken to some degree. And we have already seen the beginnings of over-reaction to this incident. We have heard our political leaders declare that our enemies will be punished and that our resolve to defend our freedoms will not be shaken. We have seen increased security measures across the country. We have even seen vandalism of a mosque in Cold Lake, Alberta. As we are left to sort out what to make of these events, it is perhaps appropriate that today we gather on Reformation Sunday. Reformation Sunday is the day we set aside each year as Lutherans to remembers our 500 year history, and where we came from. We remember the catholic monk Martin Luther, whom we are named after, standing up against the injustices of the pope and the church – the selling of salvation, the abuses by church leaders, the exploration of the faithful. We remember that our faith and our beliefs are important. Important enough to die for, important enough to defend. But on Reformation Sunday we also remember the division that change caused. We remember that people did die because of Martin Luther’s actions. We remember the between 125,000 to 250,000 people that died in the peasants war that resulted. We remember that after Martin Luther nailed his 95 theses to the door the church in Wittenberg, Christianity was split from 2 denominations (Roman Catholic and Eastern Orthodox) into as many as 25,000 today. And these divisions have been caused violence, chaos, oppression, abuse, suffering and death for 500 years. Reformation Sunday is day of two realities. Of promise, hope and freedom, contrasted by division, conflict and oppression. Today, you might notice the red parents that adorn the chancel area. Red is one of the 5 liturgical colours, but it is only used a handful of Sundays each year. Red is the colour we use to symbolize the Holy Spirit. The changing, transforming, reforming work of the holy spirit among us. Red is used on Pentecost when we celebrate the Holy Spirit coming to the disciples, and today Red is for Reformation. However, as Canadians, we might take some liturgical and theological license and think that Red reminds us of our national colour and of the the reality of tragedy, fear and death in our midst. And lastly, Red is used to remember martyrs in the church. And while the gunman may or may not have considered himself a martyr, we have discovered that Cpl. Nathan Cirillo is in fact the martyr this week, the one who died for principles and for a cause. And overwhelmingly, the rhetoric since Wednesday has been for Canadians to remember who we are. To remind us not to lose ourselves to grief and fear, to remember that we are a nation of peace and openness, that our values are about tolerance and freedom. It was been a week of mixed emotions, of conflicting experiences, of hard-to-make- sense of events. And fittingly, Reformation Sunday is about that too. About the conflicting experiences of division, conflict and war that accompanied the Reformation, as well as the striving for justice, the proclamation of grace and mercy, the hope we have in God’s promises. And if there is anything to remember today it is that. Even as Canada struggles with tragedy and celebrates the heroism born out of it. Even as Reformation Sunday demands that we recall the both the gospel proclamation of Martin Luther and the reformers, the bold declaration of grace through faith alone, that there is nothing we can do to earn God’s love and that this belief is important enough to stand up for contrasted with the division, conflict, violence and suffering caused by the reformation. Even as these realities both this week and 500 years old sit with us, ultimately today is not about those things. Today is about what each Sunday is about for Christians. Today is firstly about Christ. Today is about God and God’s mighty deeds among God’s people. Today is a reminder we simply cannot save ourselves on our own. Just as in today’s Gospel readings the Jews said that as descendants of Abraham they were slaves to no one (even though they had been slaves to the Egyptians, Babylonians, Persians and now Romans). Just as Martin Luther declared that he and we we were not slaves to law and freed by God’s grace (even though he was threatened by the Pope and others). Just as Canadians declare that we will not loose ourselves to fear, to revenge, and hate. We are still slaves to all of those things. We are slaves to enemiy nations. We are slaves to the law. We are slaves to fear, fear of the other, fear for our safety, fear of losing power. No matter what our leaders declare, no matter the bravery we display, the sacrifices we make, the peace we try to uphold. We simply cannot save ourselves. We simply cannot free ourselves. We are slaves to sin, slaves to suffering, slaves to death, and there is nothing we can do about it. And that is why today is ultimately about Christ. Today is about the promise that God gives to slaves. To those enslaved by sin, those enslaved by suffering, to those enslaved by death. Today, is about the promise that God gives to us. The promise that despite our condition, despite our slavery, that God is showing us mercy, God is giving us grace, God is making us free. Free in the son. And this promise of freedom comes to us first in baptism. In baptism where we drown and die to sin, and where we rise to new life in Christ. So perhaps it is fitting today, that we are going to extra lengths to celebrate those promises of baptism, because confirmation is really about baptism, about these young people in our midst recognizing their baptism, recognizing the promises made to them in water and word, made by God. And just perhaps it is a powerful act of defiance against violence, against oppression, against fear for us to bless and support our confirmands. Perhaps it is beautiful act of hope that not only do we welcome again these young people into the Body of Christ, but we pass on this church, this faith, these promises to them. Even while we are slaves to sin, to suffering and most of all to death, we pass on our hope for the future to these young confirmands. A future promised by God in the midst of slavery. A future given by grace and mercy, even though we are dead. A future found with New Life in Christ. …Then he said to them, “Whose head is this, and whose title?” They answered, “The emperor’s.” Then he said to them, “Give therefore to the emperor the things that are the emperor’s, and to God the things that are God’s.”… (Read the whole passage here). This morning, after hearing 10 faith statements from our confirmands, we hear Jesus and the Pharisees having a discussion. They are debating how to be someone who has faith in God, and someone who lives in a world full of political and economic powers that divide our attention and allegiances. Do we ally ourselves with God, or Caesar, the symbol of world power. It is all part of our journey through the Gospel of Matthew that began last year, but particularly through the summer we have been hearing Jesus’ teaching along side of our human desire for control, power, easy answers, black and white categories and so on. And it would seem natural at this point to tie confirmation or affirmation baptism that we will celebrate next week with some kind of choice to stand up for faith, for you confirmands to become “adult Christians.” Kind of like the choice between God and Caesar that Jesus is talking about today. And yes, confirmation has that aspect to it. There is something distinctly adult about standing in front of the church and sharing out loud what Jesus means to you. And some think that confirmation is about making the adult choice to stand up for Jesus. So confirmands, I think it is important to recognize what you have just done. You have been bold and brave to share your faith and to do it in front of the whole church. But not only have you done that, but you have shared your faith statements after more than two years of study and learning, of classes and community, of coming to this strange place with these strange people while most if your peers and friends were sleeping in on Sunday mornings. Now your bravery this morning is certainly an example to the rest of us, and we are all proud to see you, our young people, standing among us sharing your faith. But some honesty in this moment is called for as well. This may be difficult to hear, but bear with me. After the last two years of classes and studying and learning about faith, a lot of you, maybe even most of you will not come back to church very often after next Sunday. A few of you might become regular and active church members, but likely not many. And after today, there will be a lot of things, a lot of other options that will pull you, and that pull all of us away from church and away from faith. But the options and other things to do on Sunday mornings are not the only thing that will pull you away. And again bear with me. The things that we talked about in confirmation God, faith, church and the bible, are probably not things that your parents talked much about with you. And studies show that if faith is not talked about in the home, the chance of youth staying involved in church is very low. But this is not about blame. Your parents didn’t talk about faith to you, because their parents didn’t talk to them about faith. And your grandparent’s parents didn’t talk to them about faith. And even though the small catechism that we used in confirmation to help us learn about the ten commandments, lord’s prayer, apostle’s creed, baptism and communion was written by Martin Luther for parents, particularly fathers to use to teach their children about faith… the church for hundreds of years has been making people think that God and the bible can only be talked about and learned about at church. And that is our fault – pastors and church leaders fault – we are to blame for why parents are not teaching the faith to their children. So confirmands, (and families), you have now heard me say that most of you will probably not be back to church after next Sunday. But I want to be clear that this is not to make you feel bad. In fact, if the reason you and your families come to church is because you feel like you should… then I don’t want you to come. Church is not a should. Faith is not a should. God is not a should. But back to that in a second. Remember the debate that Jesus has today about the Emperor on the coin, giving to God what is God’s and giving to Caesar what is Caesars. This is not an easy task. If we feel like we should come to church, but we want to sleep in, or do homework, or go shopping, or play sports, or dance, or whatever… we might try to go to church like good little girls and boys should… but that will last only a while until what we want to do seems much more interesting. Giving to God what is God’s sounds nice, but let me tell you, giving to Caesar what is Caesar’s is a lot more fun. And here is the thing about church. If you are looking for great music, the radio will always have something that sounds better. If you are looking for an entertaining sermon, tv and movies will always be more appealing. If you are looking for food that tastes better than bread and wine, any restaurant has better. If you are looking for fun youth events, family programming, or seniors groups, the YMCA, the mall or and most community groups can do more than we can. The church is just not as cool as the world, as cool as Caesar’s stuff and so the church won’t be entertaining enough to make you come. Guilt won’t be enough to get you out of bed on Sunday mornings. Becoming regular church attenders after next Sunday is something you will have to want to do. And our responsibility is to make this place somewhere that you would want to be. And so what does the church have offer? What would make you want to come instead of feel like you should? Remember Jesus talking about Caesar and God. When the Pharisees asked Jesus about paying taxes with Roman coins, he asked for a coin because it has the picture of the Caesar, the emperor on it. And next to emperor’s picture two words were printed – “Caesar God”. The romans thought that their Emperor was God, and so when Jesus said, give to Caesar what is Caesar’s and give to God what is God’s, he wasn’t really talking about this choice between God and the world. Caesar and his image on the coin represented humanity’s desire for control, our desire to be powerful, our desire to define God and Godly power. Jesus is reminding us that this is not true. Jesus is saying that we don’t always get to decide who we are, nor do we get to say who God is. The world, things like school, sports, shopping, tv, dance. Things like power, money, security, control, black and white answers etc… these things are trying to tell us that we get to decide who we are. That we can be anything we want. A rock star, an NHL hockey player, a marine biologist, a doctor, that we can be rich, young, never sick, famous and powerful. So what does the church, what does God tell us? Here at church God doesn’t let us decide who we are, but tells us who we are. God tells is in Baptism that we belong to God. That we are children of God and that is the most important identity we have. In communion, God tells us what we are members of the Body of Christ, of this family of faith that gathers here at Good Shepherd and that gathers as Christians all over the world. God tell us who our family is, God gives us brothers and sisters in faith, who are there for us when we struggle, there for us when we celebrate, there for us in daily life. In God’s church, we are welcome no matter what. We don’t have to be anyone special, we don’t have to be achieve anything, or commit to anything. In God’s church, we are not told us that we should do anything. In church we hear what God has done for us, we hear how Jesus is working in our lives, and we are promised that when we fail, when we are broken and suffering, and when we die, that God is there putting us back together, giving us new life. So confirmands, today you have given us your faith statements in front of family, friends and the congregation. You have been brave and bold to speak, and we are proud. And while I reminded you that confirmation is not graduation from church, meaning after next Sunday you are not done church, but invited to engage church more. Don’t hear the message today that you should come to church. Faith, church and God are not things you should do. Instead, hear today that in this place, with these people, with this God you are welcome no matter what, that you are a part of this family and that you belong here and belong to God. And when all those Caesar things, those world things fail to turn you into the things you want to be, here you will always belong, always be family, always be loved. Here, God will always tell you who you are. I am a high-church liturgy nerd. For many of my 31 years in the church, I have been told that my generation is a group of moths attracted to the glitz and glamour of projections screens showing videos in church, electric guitars and drum kits playing the music we can hear on Christian radio and cool, hip preachers who speak “authentically.” And sure, I have been to my fair share of churches, campfires, and youth services that cater to the “youth.” I have even enjoyed them greatly! Somewhere along the way, this has led to the assumption by everyone (and no one) that my generation’s desire is only for the new. And this desire is often held up along side our narcissistic tendencies to take selfies, post our dinner plans on twitter, and live in our parent’s basements. It just so happens that these same lazy narcissistic millennials are currently the concern of so many church members. Churches spend a lot of energy worrying about what interests us and wondering why we don’t come to church (anymore). I know millennials are not the first generation to be the object of the church’s and society’s attention. When I was a little, churches were trying to be contemporary then too… trying to attract boomers and their young families with 70s folk music. As a child of the 80s, my church had more than a few 30-40 something guys standing behind lecterns with guitars, singing special music that sounded like an Eagle’s song with Christian lyrics. And then Generation X got its 15 minutes of attention…During my tween and teen years, the Gen-Xers were doing Friday night youth services once a month with songs from artists like Brian Doerksen, Petra, Amy Grant, and Third Day. The Gen-Xers, we were told, would come for this. As a teen watching this unfold, I hadn’t quite processed what it meant for the church to be so concerned with making sure 20 somethings stayed in church. I didn’t understand why Friday night youth services, token 20 somethings on church council and money for expensive sound systems and projectors was going to keep the young adults, just a little older than me, in church. Yet, despite all the catering to what the young people supposedly want, what I do remember from church of my childhood is liturgy. When we were all together as a community, when we gave up as much as we could trying to cater to what will attract the youth, or appease the seniors, or keep the young families interested, or make the boomers happy, we did simple Lutheran liturgy. Now don’t get me wrong, it was low-churchly Lutheran liturgy. Which is to say our worship felt a bit like eating vegetables; it was good for us, but no one really liked it. Or at least we acted like we didn’t like it. Our worship was billed as being everything from “Bach to Rock,” but the liturgy was more of a timeless aspect of our worship. As a kid and then teen, I could feel the prayers, the liturgical songs, the actions of standing, sitting, praying, responding, receiving were starting to ingrain themselves in my very body. I remember myself starting to set the hymnbook down more and more. I would simply pray or sing or respond. The phrases like “And also with you” or “Thanks be to God” or “Amen” started to come naturally and unbidden. 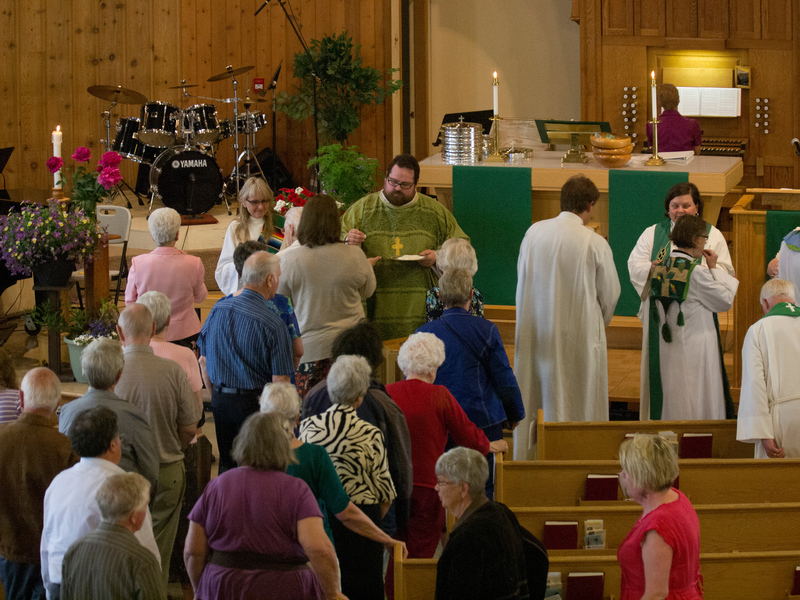 Interestingly, our low church Lutheran liturgy, that felt like eating vegetables, connected our whole congregation much more deeply than any of the things that we did to attract different generations. Weirdly, we all liked it. We all shared in it. In fact, we came to the same worship service because of it. Liturgy doesn’t distinguish between generations. It’s kind of like how I don’t play Xbox with my grandma, and she doesn’t knit with me. But we both know how to sit down and share a family meal. Liturgy ties us together, rather than emphasizing our personal or generational experiences. Liturgy is timeless and when we can get past whether we like the tunes or instruments playing them or not, we can realize that these things we do, and repeat together, are biblical, rooted in the ancient Church and are about God. 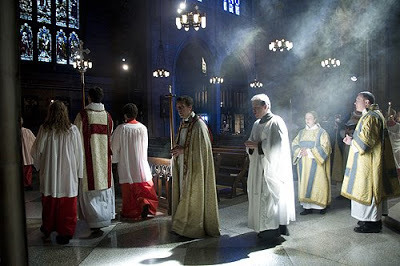 In fact, liturgy at its best makes us forget it is liturgy and instead helps us see God in out midst. I am folding laundry, its starched, orderly scent a sort of incense, as the hymn rises to my lips. I can’t remember the rest of the words exactly, and the tune meanders a bit, so I improvise, prompting Dan to shout from the other room, “Hon? You okay? You crying about something?” which happens just about every time I burst into spontaneous song because, apparently, my version of a joyful noise remains indistinguishable from a sob. It is a season of new songs. Like me, she is a millennial and a Christian (if you haven’t discovered her blog, you are probably living under a rock). If the two of us were to sit down for coffee, I would tell her that this will only get worse (or better). Way worse. When you become a liturgy person, all those familiar texts like the Gloria (which is what Rachel was singing) start to come to your mind like the baseball stats that so many dads seem to know – they come automatically. Worship starts to take on a rhythm and pattern that you can’t escape. You will eventually find that worship is something where you always know what is going to happen next, or that your body knows what to do next. The things that change start to rise to the surface and catch your attention. After the familiar Kyrie and Gloria, which are the same week after week, the collect and scripture readings, which change each week, stand out. Liturgy helps you to identify the new and changing things of worship, by keeping you grounded with the constants. And still, it gets worse. When you are a liturgy person, you can show up for Anglican, Episcopalian, Roman Catholic or Lutheran worship and generally know what is going on. You might even find yourself singing songs you have never sung before because you already know the words. In my development as a liturgy person, my low-church, eating-our-vegetables, experience of liturgy as a child and teen morphed and grew into something more as I went to university and then to seminary. As I learned more and more about the meaning and history of the symbols, I fell in love with the richness of it all. I became high-church. I became a liturgy nerd. And I am going to make a bold claim because of this. Liturgy can engage the young people. I am not saying that non-liturgical worship is wrong, or won’t “attract” millennials. In fact, I know many of my generational cohort who have abandoned liturgy for praise bands. But like Rachel Held Evans shows, some are coming the other way. Contemporary worship is not something I am looking to critique, but rather I am suggesting that all those criticisms of liturgical worship is simply unfounded. I am a millennial and I am drawn to tradition, to wrote prayers, to words passed on to me from generations before. The symbols and ritual actions point to God in ways that nothing else has in my experience, not sunsets or Christian radio, not preachers with graphic T-shirts and 45 minute sermons. I don’t think I am alone. I am not saying that every millennial wants what I want. Liturgy is what it is, it doesn’t really sell itself. And I think many of my generation are not interested in being sold faith. So to my liturgically minded brothers and sisters in faith: Let’s stop worrying about being something we are not. Let’s not try to be contemporary like the Baptists down the street while still somehow still being us. And for heaven’s sake, lets not do liturgy like it is eating vegetables. Let’s see liturgy as the beautiful meal of diversity and rich flavours that it can be. We will never be the mega-church contemporary worship that we think all the millennials have left for. And the narrative that we need to be that to “attract” the young people only shows them that we have an identity crisis, and that what we are, is not worthy of our youth. I am sure many millennials find that off-putting… I do, and I am a pastor in a denomination with an identity crisis. Instead, let’s be what we are. Let’s use the tools that we know how to use. Let’s preach the Gospel and point to God at work in our world with the liturgy we have been given. And remember, as surprising as it may be to hear that one millennial is a high church liturgy nerd… it might be even more surprising that there are a lot more out there. As usual, thanks to my wife, Courtenay for her edits and insight. Follow her at @ReedmanParker on Twitter. If you like what you read on The Millennial Pastor, you can vote for this blog on Christian Piatt’s list of top 25 Christian Blogs of 2014. You might have to scroll down the list a bit, but as of this post, I am in the top 50.